This mahoosive new tour of Hairspray started in the middle of last month and stretches right through to June 2018 and it certainly feels like it has the potential to be a great success. There are some cracking performances which really elevate Paul Kerryson’s production of this most effective of shows (music by Marc Shaiman, lyrics by Scott Wittman and Shaiman, book by Mark O’Donnell and Thomas Meehan) and choreography from hot-shot of the moment Drew McOnie. And given how dance heavy Hairspray is, it is an astute move from Kerryson as McOnie’s inventive use of movement establishes and reinforces so much of the febrile mood of simmering racial tension and potential societal change. In the hands of the likes of Layton Williams’ Seaweed and an effervescent ensemble, it’s hard to keep a smile from your face as the sheer toe-tapping enthusiasm of it all as fabulous group numbers shake and shimmy their way across the stage. Slight reservations about men taking women’s parts aside (*cough* Craig Revel-Horwood *cough*), Matt Rixon’s Edna is sensitively portrayed in locating real heart within the broader character moments, and Gina Murray’s Velma is a vivacious villain against her. And it is hard not to be thoroughly impressed by Brenda Edwards’ ferocious vocal performance as Motormouth Maybelle – really selling the weight of the socially conscious material. But for all that I enjoyed, I couldn’t help but feel that the central couple here are still feeling their way into the show. Rebecca Mendoza is making her professional debut as Tracey Turnblad and she does do well in establishing a genial stage presence. Her singing voice doesn’t quite match up to the full breadth of Tracey’s ballsy confidence at the moment, similarly Edward Chitticks doesn’t have the full measure of Link Larkin’s innate charisma yet – as the tour progresses though, you can imagine they may well yet both grow further into their roles. Given the length of the tour, I can easily see myself going back to reassess Mendoza and Chitticks, such is the joy of the production around them. And it is a real pleasure to see the work of one of our brightest choreographers in Drew McOnie proudly taking centre stage across the country, not just in a London where his reputation is deservedly fixed. As unlikely as it may seem, you could easily make the case that some of the best musical theatre happening in London right now is taking place above a pub in Highgate. John and Katie Plews’ Ovation Productions have a sterling record in small-scale smash-hit musicals at the Upstairs at the Gatehouse theatre and their festive shows are usually the pick of the bunch. 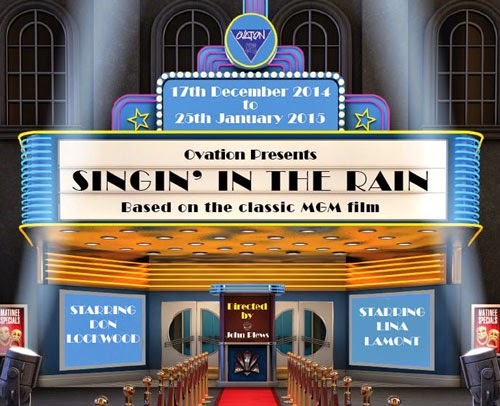 This winter sees them take on the perennial classic Singin’ in the Rain and naturally, it is a gloriously resounding success. And yes, of course there is rain – you gotta go to see how they do it though. The true life story of Janusz Korczak a Polish Jew who protected some 200 children from some of the worst horrors of the Second World War may not seem a likely subject for a piece of musical theatre but strange as it may seem, it works with a devastating precision. It was written in 1998 for youth theatre groups by Nick Stimson (book and lyrics) who also directs here and Chris Williams (music) but this version is presented here by Youth Music Theatre – the UK’s leading national music theatre company for young people – at the Rose Theatre in Kingston.